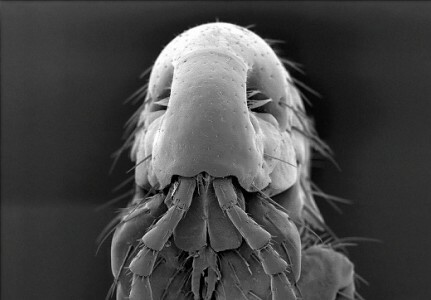 There are over 2500 species of flea, and new ones are being identified all the time! Fleas can jump around 30 thousand times in a row! They can also jump very high. If they were human-sized then they would be able to jump over the Eiffel Tower with an acceleration force of 140G… That’s an acceleration rate 50 times greater than a rocket taking off into space! Fleas can lift objects 150 times heavier than their own body weight. Once adult fleas emerge from their puparia, they have approximately 7 days to find a blood meal or they will die. Females can consume 15 times their own body weight in blood on a daily basis. Female fleas can lay about 2,000 eggs over the course of their lives, but are incapable of laying eggs until after their first meal. Once they have had their first blood meal, female fleas will lay their eggs within 35 to 48 hours. Flea eggs are usually laid directly on a host, often falling off and spreading the infestation to the surrounding environment. Over 2500 species of fleas have been identified by entomologists but many more are thought to exist. Entomologists are scientists who study insects.